There are many reasons you would like to try an alternative for Windows Store app, but many are using below listed Windows Store option because their Windows Store app is not working, it can't be fixed with all solution available to solve crash apps issue and the app troubleshooter. If you have used Windows, Android and other old age operating system on mobile (Symbian, Bada, Nokia s40, Java, etc. sort of ), they all have a place to get apps the place called app store. Android have its Google play app store; iOS have Apple app store, and Windows 10 features Windows app store to download and install third-party apps. I love Windows app store but what if it stops working or someone who hate and don't want to use Windows app store at all? If you are one of them, you can try some good alternatives listed here. These stores are a perfect replacement for Windows app store and let you download (install) all software (even more) than Windows app store. PortableApps :- Portable apps in not a perfect replacement but has a collection of more than 200 portable apps that runs as an app on Windows 8 and above. You can download it from Portable Apps website. You will need to choose from a categoriesed list of freeware software and then download standalone installer for them. 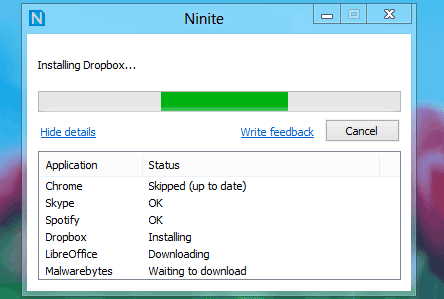 Download Ninite from here. Ketarin :- Ketarin works similar to Ninite but has some different silent installer included, their tag line is "Instead of food we serve you software. Comparing to Ninite both are similar and a good alternative to Windows store app. Soft2base :- It is basicall a Windows application manager, let it users install and update softwares silently but very unprofessional. I would recommend using Ketarin and Ninite above this. As there is no suiteable alternatives for Windows Store app but there are some good bulk installer which can help you to install multiple essential freeware software with no head ache. If you know any alternative for Windows app store, do let me know in comments.